1st & 2nd pictures are of matted hair in a net, 3rd picture is of hair saturated with the Take Down Remover on the hair, and 4th picture is the final After picture of her beautiful hair restored. 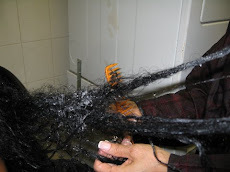 Most women do not take tangled or matted hair seriously until it is too late. When the hair is not maintained properly and tangles are not combed through immediately....the result is disheartening. If your hair begins to tangle and matt in certain areas, one has to detangle through the matted hair. If not the matted clump will begin to spread across your hair. It will grow into a harder clump that may seem inpenetratable. Above are pictures of a woman that allowed her matted hair to get worse over a period of 7 years. Some women just don't know what to do and are scared because most hairdressers just want to CUT their hair off. Before you know it you are concealing knots in your hair for days- which become weeks and weeks become years. This de-tangling and hair restoration process was done over a 30day period, with special care by Tangled Hair Tech- Jeanene Barrett.